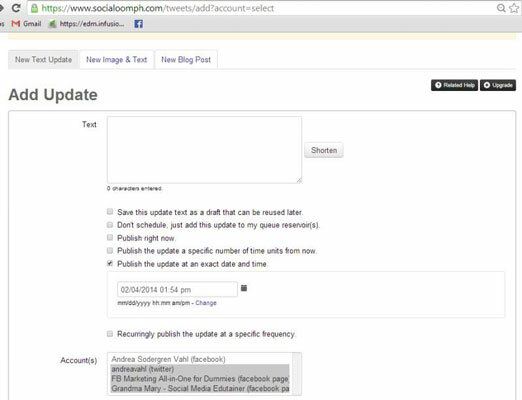 SocialOomph is a web-based tool that focuses mainly on Twitter, but the paid version lets you update Facebook Profiles and Pages. As of this writing, the paid version is $17.97 every two weeks (a little different than your traditional weekly or monthly billing cycles), but some of the features are quite useful. For example, you can bulk upload a file of posts and schedule them. Or you can use posts into a set of status queue reservoirs so that you always have posts to draw on when you need them. You can reword the post a bit and post it out again for some of the evergreen content on your website. Let the application decide when to post based on times that it determines are the optimal times to share content for your audience. For example, if your audience is more active in the evening, your posts can be sent in the evening. Program the times to post the content for each social site. For example, you can program that you want four tweets per day going out at 7 a.m., 11 a.m., 1 p.m., and 4 p.m. You can also select that you want two Facebook posts per day: one at 9 a.m. and one at 2 p.m.
Now you can fill your buffer with content, and the application puts the posts in the appropriate time slots for each social site. 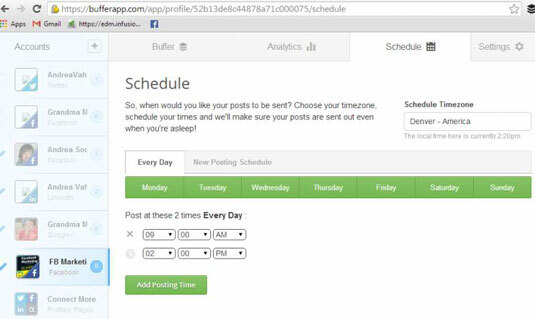 You can also program different posting schedules for each day of the week. Pretty slick! One other cool feature of Buffer is the available Chrome extension. If you’re using Chrome as your web browser, you essentially click one button at the top of the browser to add an item to your Buffer contents. So if you’re browsing around the web and you find an interesting article that you know you want to share to your social sites, just click the button, and a pop-up appears to add the content to your Buffer. Okay, it’s really two clicks, but having a second click ensures that you really want to share the content. After the Buffer free trial, plans start as low as $8.50 per month. Sprout Social also offers some helpful reporting features that you can use to automatically create shareable reports regarding your social media activity and growth. The reports are especially useful if you’re managing someone else’s Facebook and/or Twitter accounts so you can easily show what has happened over the last month with their accounts. You can monitor different feeds for content like a Twitter list, RSS feed, or LinkedIn news feed and then share posts from those Feeds. 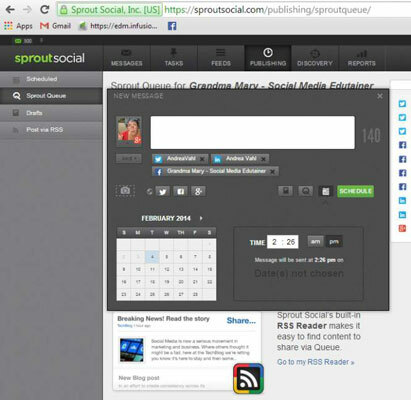 Sprout Social has a free trial and then starts at $39 per month.